Newfoundland dogs are known for how amazing and gentle they are. 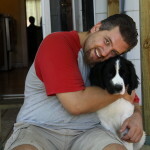 Newfies are wonderful family pets, gentle and patient around children and other pets. They are giant dogs, but think they are lap dogs! You have to be careful, because if you let them, they will take over your entire couch! But don’t worry about your heart, it will be theirs utterly and completely! 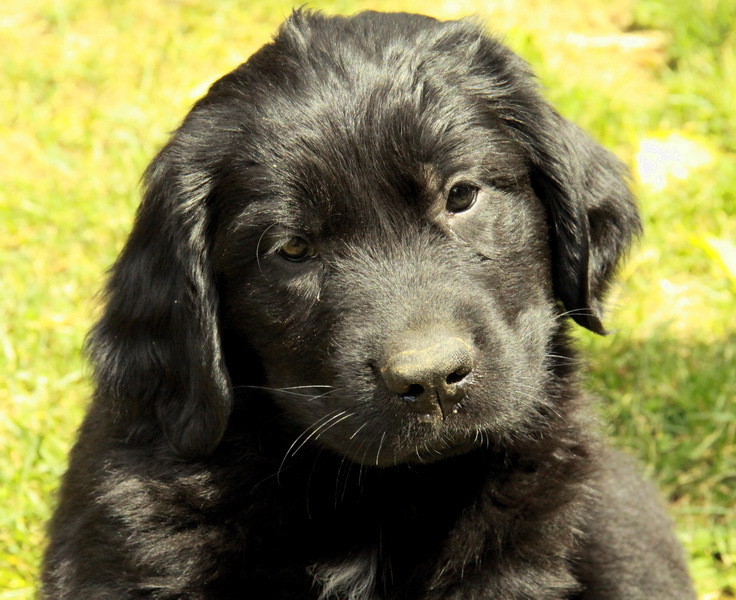 Newfoundland dogs are quick and eager to learn and are big people pleasers! 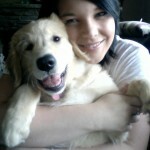 They want to make you happy, so if you’re proud of them and show it, they will be great dogs. 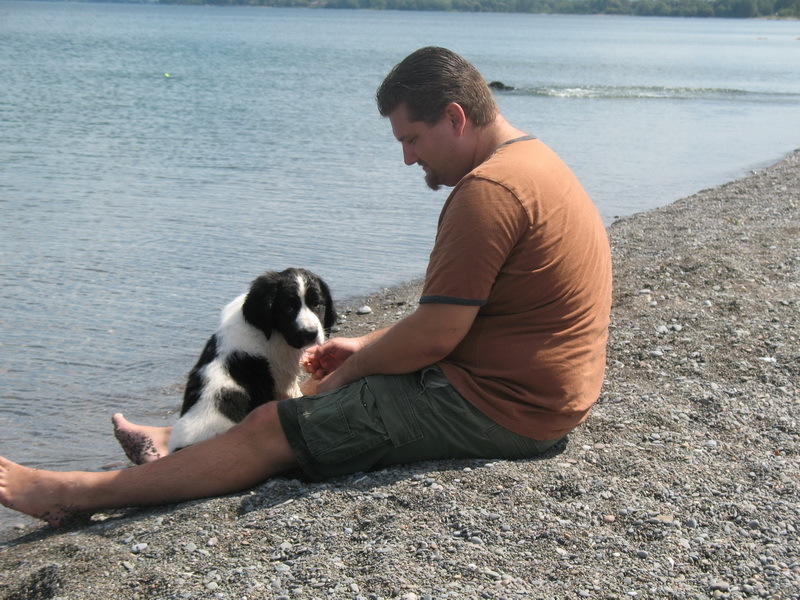 As a puppy, they grow so incredibly fast – our Newfie grew at a speed of 5lbs per week, and she was the smallest in her litter! Our own Newfoundland Dakota was in puppy classes at 8 months old, and was so smart, she kept looking at me and the treat I was offering her as if “Really? Again? You think I don’t know it yet?” It was so funny to train her, because as much as she loves her treats, she would learn so quickly what she was to do, that she was just done! Newfies are just that smart! 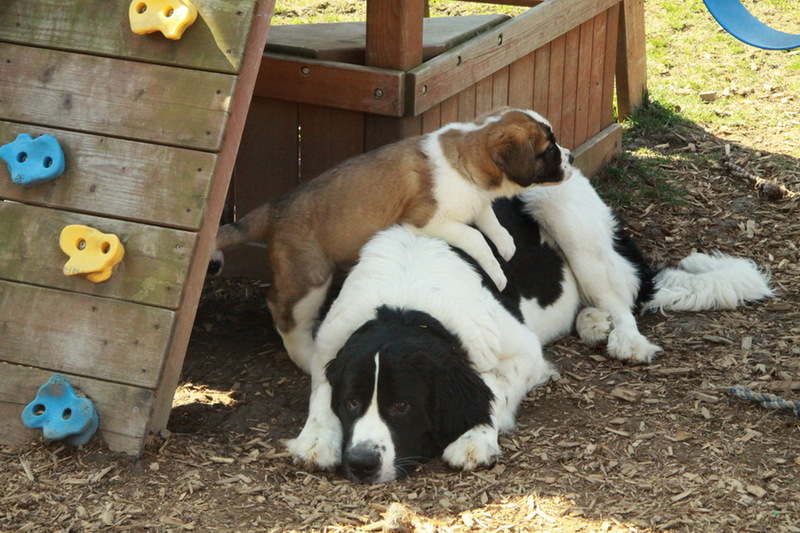 As a foster family for puppies, our Newfie Dakota has had many puppies jumping on her, crawling all over her, chewing and pulling on her, and she just lays there taking it all. She is so easy going, she just doesn’t mind! Puppies will even use her as a step stool and climb onto our couch from her back! You will need to be prepared for the amount of hair that is shed from a Newfoundland dog, but for a wonderful breed like this, it is worth it. 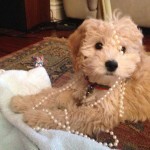 Regular grooming helps get rid of the loose hair, and keep it from getting too matted. Occasional hair cuts at a groomer will help as well through the season changes, as well as tidy up the longer hairs. Ear care is important as well. Keeping the ears dry and occasionally cleaning them out helps keep the ears healthy. Newfies are known for their love of swimming, so a good drying afterwards is helpful. As the Newfoundland is such a giant breed, there are a few main health concerns to keep an eye out for. Knowing what these are is the first step in prevention. 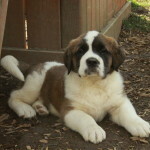 Giant breeds are obviously candidates for hip dysplasia, elbow and knee issues, as well as general joint problems. One of the best ways to help keep these health concerns at bay is to start giving your Newfoundland liquid glucosamine from about 1 year old, according to the recommendation of your vet. It is available at major pet stores as well as over the counter at your local pharmacy. Another common health problem is bloat or twisting of the stomach. 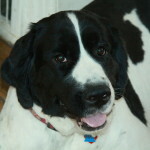 This occurs in large and giant breeds such as the Newfoundland. Some causes are said to be eating only one meal per day, eating too quickly, heavy exercise too close to eating, or eating food from ground level. 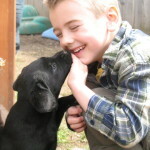 If these are some debated causes, then the solution would be to make sure to feed minimum two meals per day (recommended for any size dog really), slow down the eating process by adding weights such as rocks, balls, specialty bowls or other such methods to slow them down, not allowing your dog to run around or exercise too much right after eating, and most of all, by raising up the food and water dishes to a comfortable height. Knowing these things can help prevent a lot of pain and anxiety, and costly surgery and even death for your beloved pet and family member. 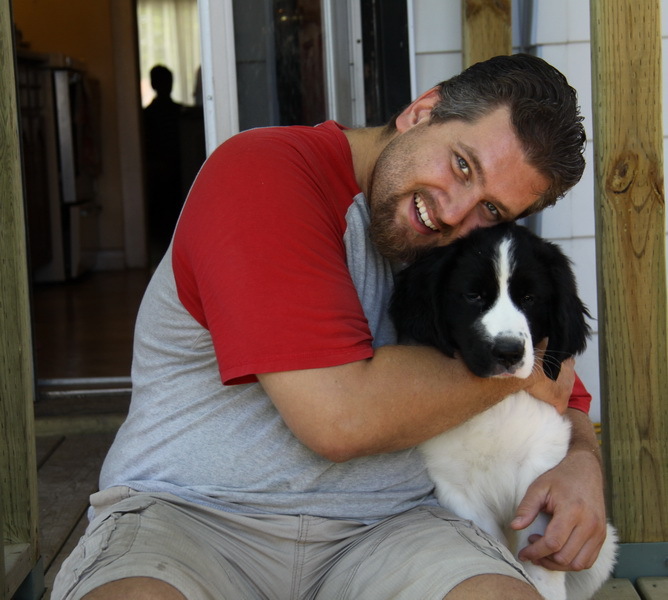 Adding a Newfoundland Puppy to Your Home! 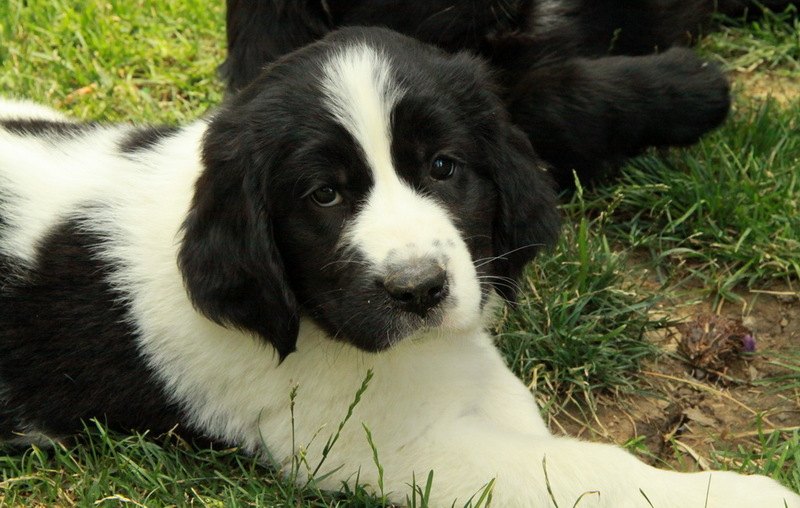 We have a litter of purebred Newfoundland puppies born on January 8, 2013. There are males available in this litter. 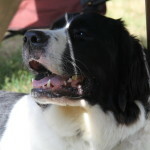 We have blacks as well as the Landseer colouring of white/black. 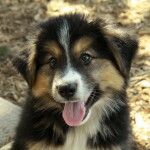 Incredibly adorable! They will be ready for new homes as of March 5, 2013. 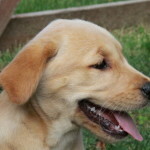 Deposits are being accepted now to reserve your choice of puppy. 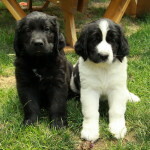 Their mom and dad are the parents of our own stunning Newfie, Dakota (the white/black puppy pictured on the left). 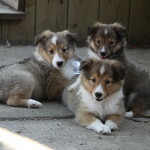 They are family dogs on a farm and are wonderful and friendly dogs. 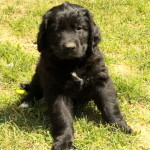 For more info on this available litter, please visit our available puppy page and call us at 905-393-8827 for more info on our adorable Newfoundland puppies for sale!